Users are increasingly searching for products or services based on location, putting local businesses in a fierce battle to be the first solution searchers find. A battle that cannot be fought alone! 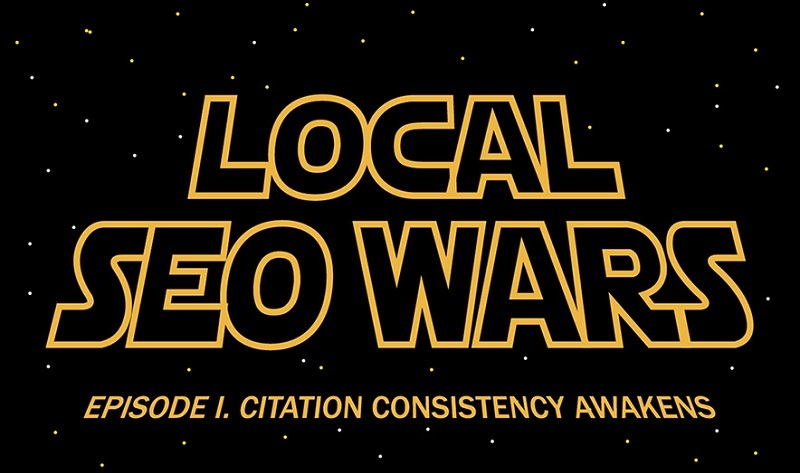 The following infographic created by OptiLocal - Episode I of the Local SEO Wars - the Citation Inconsistency Awakens encourages local businesses to prepare a reliable army of business citations that will help fight this battle for higher local rankings. The infographic illustrates what citation inconsistency is, how it can negatively influence your local business and ultimately, provides suggestions on how you ended up suffering from inconsistencies in the first place. By transforming your business citations into the Stormtroopers of the First Order, the infographic puts you on a mission of turning your army of soldiers to the Light (cleaning up your citations to avoid citation inconsistency), just like Finn did in The Force Awakens, escaping the First Order to follow his heart serving the Light. Citations, an essential element of local SEO, are among the first aspects of your local business’ strategy to consider when aiming for enhanced online visibility. Defined as the online mentions of your business, citations present search engines and customers with information on your business Name, Address or Phone number (NAP). In simple terms, we can say that they play the role of your online business card. Business directories such as Manta, Yelp or Yellow Pages host your citations in the form of business listings. Your “hosts” could be generic directories and list businesses with no segmentation of geographic or industry related information or local and niche directories, where businesses listed are specific to a location or industry that the business operates in. It is important that you are listed in authoritative and relevant business directories as they are among Google’s and other search engines’ top sources to feed data from. For your citations to be able to fulfil their destiny of supporting your business, it is vital that they remain consistent and up-to-date. When managed correctly, citations can serve as your loyal army of troopers, supporting your business in expanding its online reach. However, if there are any discrepancies found within your NAP across sources, you may find your business steadily heading downhill. Take, for instance, that you have created two separate but devoted soldiers (citations) in Manta and Yelp. One of your soldiers presents your phone number as 222-453-2222 while the other insists that you can be reached on 222-453-2223. The immediate reaction is to consider the confused customers, provided with this baffling data. However, worse is the confusion caused among search engines. They are no longer certain of which citation to consider trustworthy and accurate. Citation inconsistency may lead Google to create duplicate local pages for your business, tearing apart your business reviews, for example. Your business authority may suffer significant damage, hurting your local rankings. The credibility of your website may even lose its credibility! The reasons for citation inconsistency are not always as obvious as the example provided. Factors such as use of a tracking phone number or 800 number, having variances in your business names or trade names could all lead to citation inconsistency. Furthermore, you could have had an SEO partner in the past that may have deteriorated your citation health across business directories. It is not excluded that you may have asked an internal employee to handle your business’ citations failing to consider that they may not be equipped with the necessary knowledge of NAP consistency. If you have the slightest suspicion that one or a few of the mentioned scenarios may have happened to your business and you have failed or forgotten to audit your citations, chances are that your business may be diagnosed with citation inconsistency. Your business needs your help in reaching the top of local rankings – turn your citations to the Light and conquer your loyal army!